Jean-Paul Laurens (1838–1921), The Death of Galeswintha (1906), oil on canvas, 65.5 x 85 cm, National Museum of Fine Arts, Buenos Aires, Argentina. Courtesy of National Museum of Fine Arts, via Wikimedia Commons. Jean-Paul Laurens (1838–1921) was one of the last traditional history painters in Europe, alongside the likes of Gérôme and Rochegrosse. Like them, he continued to paint large canvases in strict Salon style until well into the twentieth century, to the continuing acclaim of the ruling classes. His narrative style was, though, quite different. He started his training in the École Supérieur des Beaux-Arts in Toulouse, then gained a place at the École des Beaux-Arts in Paris, where he studied under Léon Cogniet and Alexandre Bida. A strong republican and opponent of clericism, he had a particular interest in mediaeval French history which came to dominate his choice of subjects for painting. In the late 1800s he was commissioned to paint series of large historical works for major buildings. In 1882, he painted murals showing Saint Genevieve (c 419/422-502/512 CE), the patron saint of Paris, in the Panthéon of Paris. Between 1891 and 1896 he painted for the Hôtel de Ville in Paris, then from 1892-1902 he made a series of large murals for the Capitole in Toulouse. He taught in the Académie Julian and the École Nationale Supérieure des Beaux-Arts in Paris. One of my contentions is that successful narrative paintings should be capable of being read by a reasonably well-educated viewer with the title of the work, any supporting quotation (verse, etc. ), and the painting itself. I suggest that you try this with the following eight works by Laurens. 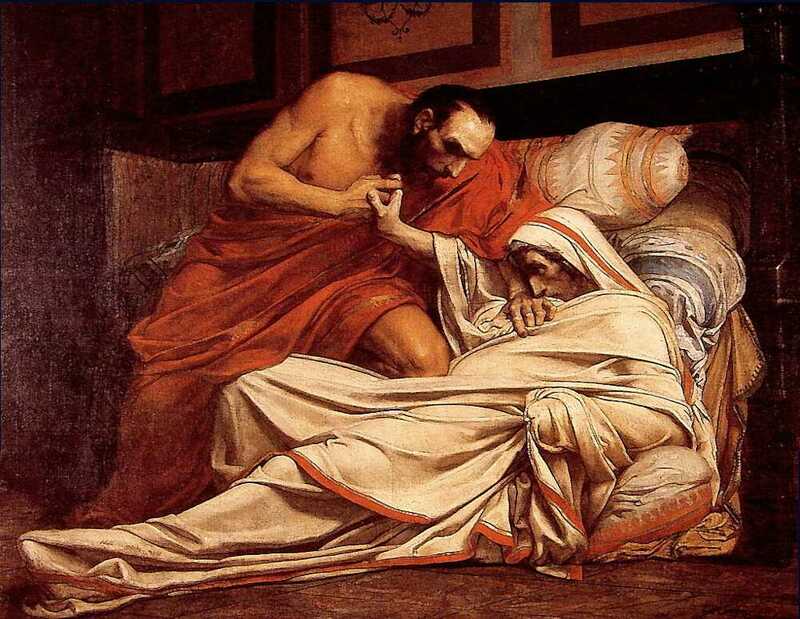 Jean-Paul Laurens (1838–1921), The Death of Tiberius (1864), oil on canvas, 176.4 x 222.3 cm, Musée Paul-Dupuy, Toulouse, France. Wikimedia Commons. The Roman Emperor Tiberius (42 BCE – 37 CE) ruled from 14 CE until his death. Known best for his military achievements, as a ruler he was dark, reclusive, and sombre. Following the death of his son, he left Rome in the hands of two prefects known for being unscrupulous. The histories of Tacitus claim that the Roman crowd rejoiced when they heard of his death, and again at the suggestion that he had been smothered by Caligula (who succeeded him) and one of his prefects. On his death, the Senate refused to grant him divine honours which were traditionally awarded to dead emperors, and mobs called for his body to be unceremoniously dumped in the River Tiber. Laurens shows the old man, swathed in his robes, presumably with Caligula or the Prefect Macro at his side. The younger man appears to be pressing on Tiberius’ chest, but not strangling or smothering him. Tiberius’ right hand reaches up towards the younger man, where it locks with his right hand, although it is not clear what either hand is trying to do. The younger man’s left knee is folded, resting against Tiberius’ right abdomen. The implication seems to be that Caligula/Macro is helping Tiberius on his way, but the body language is confused. Laurens’ timing seems slightly early too, in that it does not give any clear indication of whether Caligula/Macro is about to murder Tiberius. This may, of course, have been deliberate, as a means of suggesting the possibility but not confirming it. 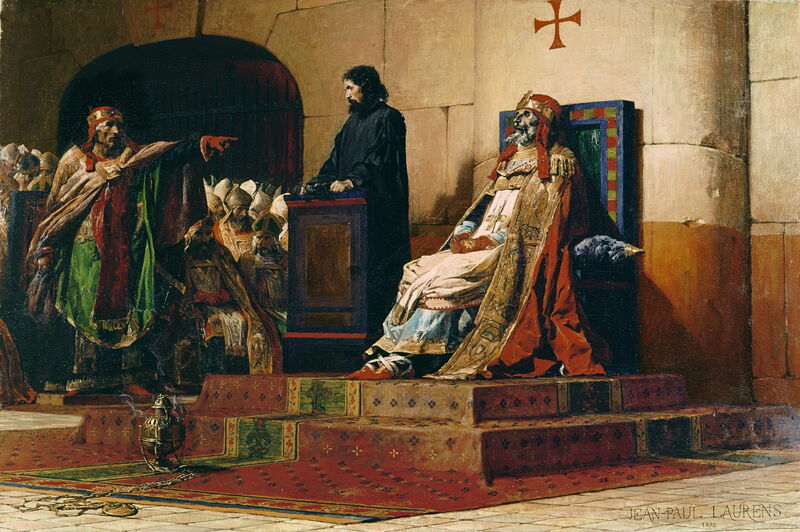 Jean-Paul Laurens (1838–1921), Pope Formosus and Stephen VI (the “Cadaver Synod”) (1870), oil, 100 x 152 cm, Musée des Beaux-Arts, Nantes, France. Wikimedia Commons. Pope Formosus was succeeded by Boniface VI, then by Stephen VI (or VII!). Stephen sought to annul the acts of Formosus, so in 897 had him tried posthumously before an ecclesiastical court in the Basilica of Saint John Lateran in Rome. Stephen accused Formosus of perjury and having succeeded to the papacy illegally. Inevitably Formosus’ corpse was unable to defend the case effectively, and Pope Stephen had it pronounced guilty, then ordered that Formosus’ papacy was declared null and void, and his acts invalid. The latter was strange, as they included ordination of Stephen as a bishop. Eventually the body of Formosus, which had been propped up in his papal vestments in the court, was mutilated and dumped in the River Tiber. The body of Formosus then apparently washed up on the bank, and promptly started to perform miracles. After a public uprising, Stephen was deposed and imprisoned, then strangled whilst in jail. At the end of the year, his successor Pope Theodore II held another synod which annulled the ‘Cadaver Synod’, and rehabilitated Formosus. Finally the successor Pope Sergius III, who had taken part in the Cadaver Synod, reversed the decision again, and reaffirmed the posthumous conviction of Formosus. Laurens shows this bizarre trial in progress. The rotting corpse of Formosus has been dressed in his papal finery and propped up in a throne. A thurible placed in the foreground burns incense to control the smell. Pope Stephen (presumably) stands pointing at the body of Formosus as a witness is being examined, in front of the synod of bishops. Although this appears relatively static, it is probably as close to a climax as such court proceedings were likely to come. 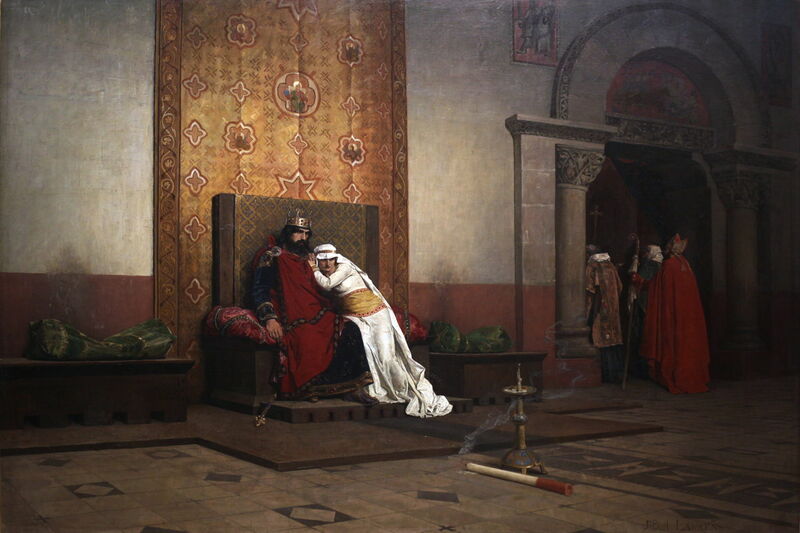 Jean-Paul Laurens (1838–1921), Excommunication of Robert the Pious (1875), oil on canvas, 130 x 218 cm, Musée d’Orsay, Paris. By Rama, via Wikimedia Commons. Robert II (972-1031), also known as Robert the Pious or Wise, ruled the Franks from 996 until his death. Notoriously religious, he conducted a long campaign against heretics, supporting riots against the Jewish community of Orléans, and burning heretics at the stake. However, he was less successful in marriage. His first (arranged) marriage to Rozala of Italy ended in divorce around 996, following which he married Bertha of Burgundy, his cousin. Pope Gregory V refused to sanction the marriage. Robert’s refusal to annul the marriage led to his excommunication, which was performed in full mediaeval style, ‘with bell, book, and candle’. That involved the tolling of a bell, closure of the Book of the Gospels, and snuffing out a candle, in a formal ceremony. Long negotiations with the next Pope, Sylvester II, were unsuccessful, and Robert’s marriage to Bertha was eventually annulled. Laurens shows King Robert II sat on his throne, Bertha huddled next to him, as the procession of clerics leaves the room. The only sign providing any clue to what might have happened is a very large candle resting on the floor in front of the couple, having just been snuffed out. Otherwise the large and regal hall is deserted. Lübbren terms this ‘inanimate narration’, in that the key narrative object, the candle, is inanimate. Although subtle, it is an effective technique for telling this story, which lacks any real climax or moment of peripeteia. 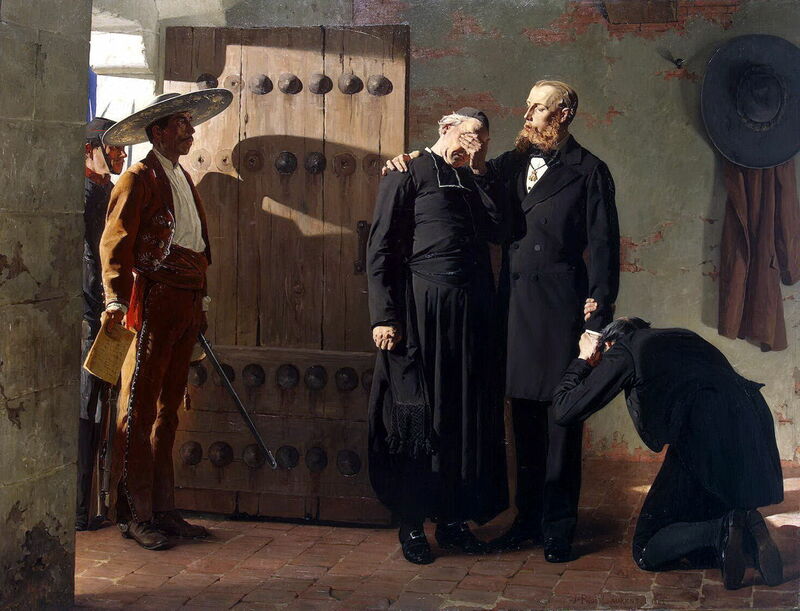 Jean-Paul Laurens (1838–1921), The Last Moments of Maximilian, Emperor of Mexico (1882), oil on canvas, 222 x 303 cm, The Hermitage, St. Petersburg. Wikimedia Commons. Maximilian became Emperor of Mexico in 1864, although he was the son of Archduke Franz Karl of Austria and Princess Sophie of Bavaria, and had served in the Austrian Navy. He installed himself as Emperor at the invitation of Napoleon III, who had invaded Mexico in 1861 as part of the War of the French Intervention. However, he was strongly opposed by forces who remained loyal to Mexico’s deposed president, and when Napoleon withdrew French troops in 1866, Maximilian’s rule collapsed. He was captured the following year, court-martialled, and executed by firing squad with two of his generals on 19 June 1867. Appeals by the leaders of Europe for clemency were ignored, and Maximilian even turned down the offer of escape, which would have required him to remove his beard. Laurens shows Maximilian comforting the priest who has come to his cell prior to his execution, while another man (presumably a servant) is on his knees and fervently grasping Maximilian’s left hand. The door to the cell is wide open, and on its threshold stands a Mexican officer in his finest dress, complete with a sword, bearing the orders for the execution to take place. Although a pale shadow of any depiction of the execution itself, Laurens’ reversal of roles – where Maximilian is comforting the priest whose role is to comfort the condemned man – introduces an unusual twist. 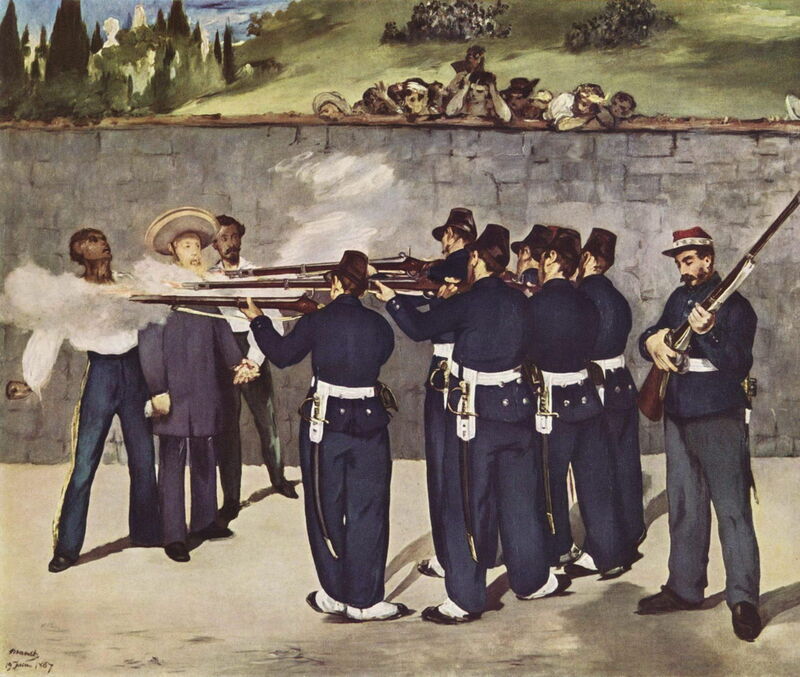 Édouard Manet (1832–1883), The Execution of Emperor Maximilian of Mexico (1868), oil on canvas, 252 x 305 cm, Kunsthalle Mannheim, Germany. Wikimedia Commons. Manet’s famous earlier paintings of this contemporary story were more direct and explicit, showing the moment of execution – the obvious climax. Apart from the wry role reversal, it is not clear why Laurens didn’t opt for such a dramatic moment. Jean-Paul Laurens (1838–1921), The Agitator of Languedoc (1887), oil on canvas, 116 x 149 cm, Musée des Augustins, Toulouse, France. Wikimedia Commons. Bernard Délicieux (c 1265-1320) was a Spiritual Franciscan friar in the Carcassone area of France. In 1299, he led a revolt against the city’s inquisitors over two alleged heretics who were sheltering in the Franciscan convent there. The following year he made an appeal against the inquisitors over another claim of heresy, and the inquisitors temporarily fled from Carcassone. Eventually his campaign against the Inquisition caught up with him. In 1317 he was summoned to Avignon, where he was arrested, interrogated, and tortured for a year. He was taken back to Carcassone for trial in 1319, found guilty of some of the charges, and sentenced to life in solitary confinement. He died in prison the following year. Laurens chooses another courtroom scene to show this story. 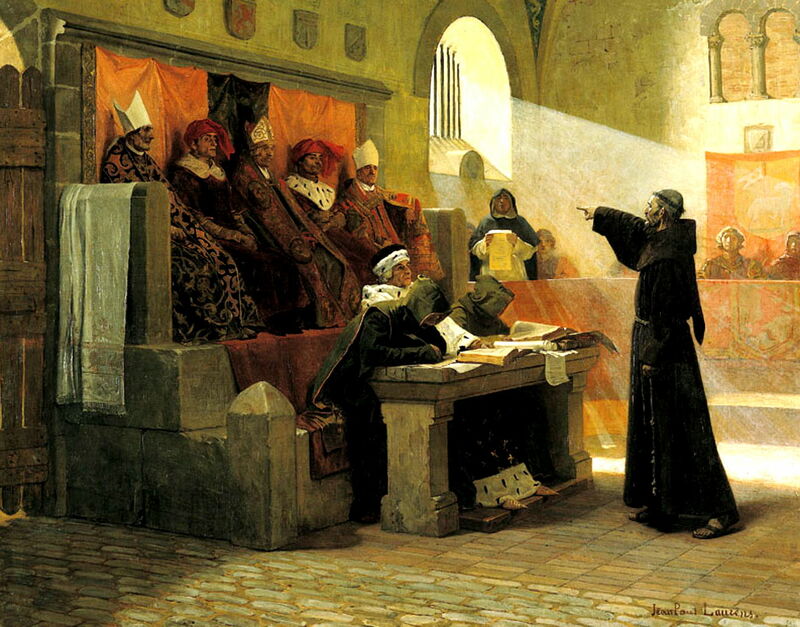 Délicieux, the Agitator himself, stands in front of the five judges of the Inquisition, pointing with his right index finger, the arm stretched out, at a witness during his trial. The witness stands in a shaft of light, pouring in through the barred window above, and is reading from some sheets of paper. It is not easy to tell, or to guess, what Délicieux might be saying. 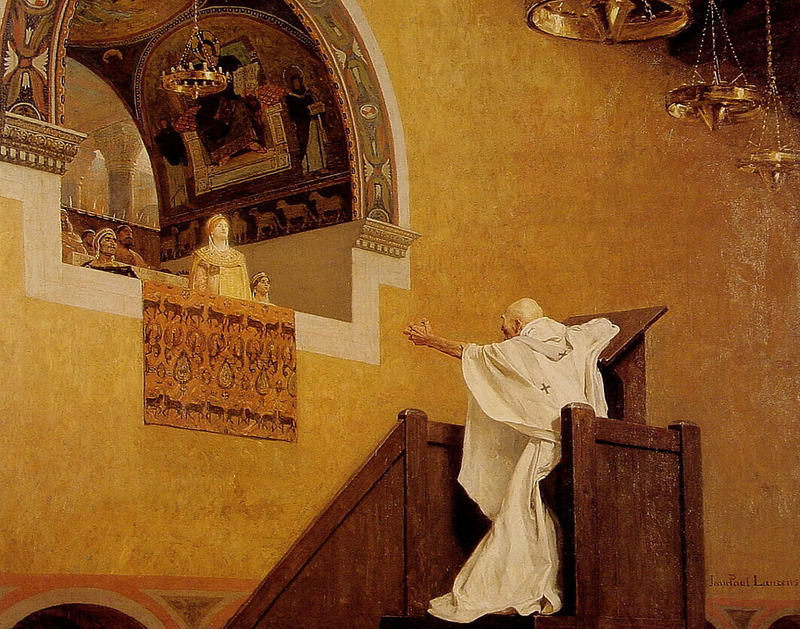 Jean-Paul Laurens (1838–1921), Saint John Chrysostom and Empress Eudoxia (1893), oil on canvas, 131 x 164 cm, Musée des Augustins, Toulouse, France. Wikimedia Commons. Saint John Chrysostom (c 349-407 CE) was Archbishop of Constantinople from 397, and one of the early fathers of the Christian Church. An ascetic, his refusal to host lavish social gatherings made him very popular with the people, but unpopular with clergy and the rich. He denounced extravagance in women’s dress, which brought him into conflict with the wife of Emperor Arcadius, Aelia Eudoxia, who considered that his criticism was aimed at herself. She organised a synod in 403, the ‘Synod of the Oak’, to charge John, and he was deposed and banished as a result. This resulted in riots, and the mob threatened to burn the royal palace. The Emperor called for John to return, and he was reinstated. However, John then denounced as pagan the dedication ceremonies which took place when a silver statue of Eudoxia was erected near his cathedral. John was banished for a second time. Laurens shows John standing at a high lectern remote from a balcony in a huge hall. He is dressed in white robes with prominent crucifixes, and is gesticulating wildly with his left arm. He looks towards Empress Eudoxia; she is dressed in lavish gold clothing, standing at the front of the balcony, and looking impassively into the distance above him. Although a dramatic scene which uses the distance between John and Eudoxia, Laurens’ composition results in both the actors appearing small within the enormity of the space in the hall, making it harder to read their body language and lessening its impact. Jean-Paul Laurens (1838–1921), Toulouse Fortifies its Defences to Resist Simon de Montfort 1218 (1899), mural, dimensions not known, Salle des illustres au Capitole de Toulouse, Toulouse, France. By Guérin Nicolas, via Wikimedia Commons. Simon IV of Montfort (c 1175-1218), fifth Earl of Leicester, was a French noble who took part in the Fourth Crusade (1202-4), and held sway in much of the south of France (le Midi). In 1215, he had acquired extensive new territories in Toulouse and Narbonne, and was declared Count of Toulouse. To secure his rule, he spent two years fighting in the area, laying siege to Beaucaire in 1216. He then partially sacked Toulouse, and returned there in the autumn of 1217 intending to capture the city. After nine months of siege, Simon was killed when his head was smashed by a rock hurled from the city’s defences. 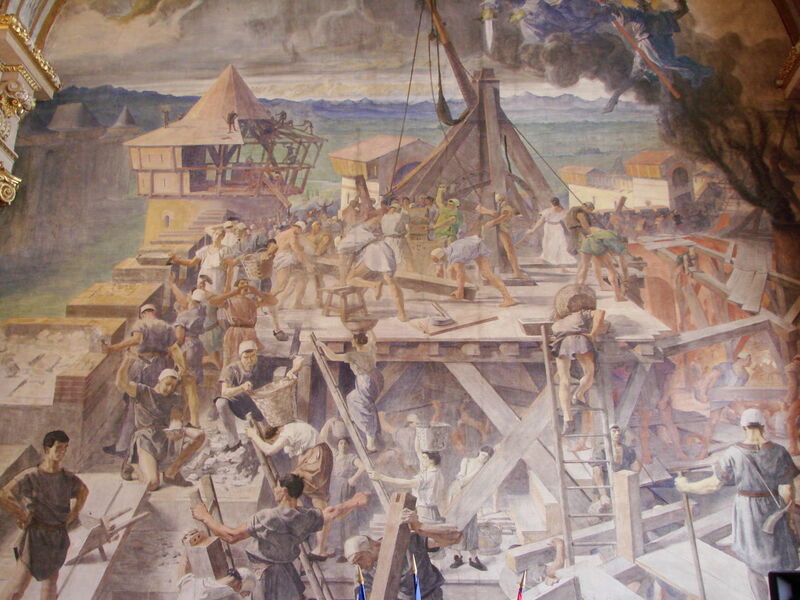 Laurens shows the frantic work, being carried out by men and women alike, to strengthen the walls of the city, including the erection of a shelter on the top of a tower, weapons for hurling rocks at the enemy, and more. However, there is no indication as to the purpose of all those frantic activities, nor to the threat posed by the absent Simon de Montfort. Galswintha (540-568 CE), or Galeswintha, was the daughter of the Visigoth king of the Iberian Peninsula (Spain and Portugal), and sister of Brunhilda, Queen of Austrasia (Belgium across to Germany). She married King Chilperic I, the Merovingian ruler of Neustria (northern France), in 567. However, marriage did not suit Chilperic’s mistress, Fredegund, who arranged for Galswintha to be strangled so that she could marry the king. Galswintha’s murder caused her sister Brunhilda to make war against Chilperic, which lasted for some forty years. In turn, Chilperic was murdered in 584, possibly by Fredegund. Galswintha was honoured in a long commemorative poem written by the late Latin poet Venantius Fortunatus, which may have been Laurens’ inspiration. 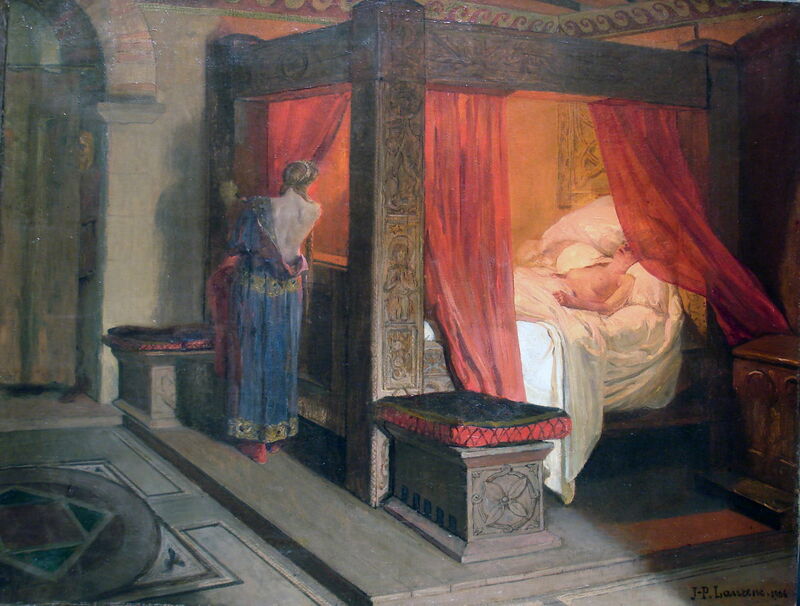 Laurens shows Galswintha lying, presumably dead, in a heavy-built four-poster bed, its curtains partly drawn back. A young well-dressed woman (presumably Fredegund) views her from the foot of the bed. Fredegund is partly undressed, her right shoulder and much of her back bare, as if she too is just getting ready for bed. Just outside the room, on the other side of a drawn curtain, is a man, who looks in through a gap in that curtain. He is presumably King Chilperic waiting for his mistress to join him, now that he is a widower and free to marry her. Although a subtle painting which requires detective work to discover its story, this is perhaps one of Laurens’ best narratives. Laurens’ response to the evident crisis in history painting was as puzzling as some of his paintings. Unlike Jean-Léon Gérôme, he avoided the spectacular, and the gruesome of Georges Rochegrosse. Of these eight paintings, only one concerns contemporary events, and six are about relatively unknown nooks of European mediaeval history (from 568 to 1319). I suspect that most of those who viewed them at the Salon did not know the stories which they depict. Yet they do not appear to have been intended to capitalise on the revanchism which followed the Franco-Prussian War, bringing recognition to Évariste Luminais. Laurens’ narrative techniques avoided climaxes, peripeteia, or even headlong confrontation with the story. In Pope Formosus and Stephen VI one of the two actors, being a corpse, is inanimate and incapable of facial expression and body language. In Excommunication of Robert the Pious the snuffed-out candle is the main actor. He also opted for court-room dramas, where surely the words are the most important part of the narrative, and notoriously difficult to depict in a painting, as in The Agitator of Languedoc. By the time that he painted what was probably his most successful narrative work, The Death of Galeswintha, his painting style was so last century (even early last century), and his intellectual puzzles had been superceded by the rush towards modernism. History painting was history. Wikipedia (French) (detailed, list of works). Lübbren N (2016) Eloquent objects: Gérôme, Laurens and the art of inanimate narration, chapter 8 in Cooke P & Lübbren (eds) Paint and Narrative in France, from Poussin to Gaugin, Routledge. ISBN 978 1 4724 4010 5. Sérié P (2016) Theatricality versus anti-theatricality, narrative techniques in French history painting (1850-1900), chapter 10 in Cooke P & Lübbren (eds) Paint and Narrative in France, from Poussin to Gaugin, Routledge. ISBN 978 1 4724 4010 5. Posted in General, Painting and tagged Gérôme, Laurens, Manet, narrative, painting, Rochegrosse. Bookmark the permalink. Great article. i just “found” this artist at the Pantheon in Paris. His paintings glowed and jumped out of the walls. Hopefully you have done another article on those – I will look for that. If not – please do!